Party build-up and the brutal Russian occupation of East Berlin with her family while behind the Berlin Wall. sleeping but whose lungs had burst from an allied air bomb and was dead. forced upon her family and others. purpose and carry it out to the best of your ability,” says Johnston. 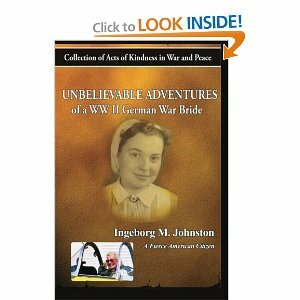 Ingeborg M. Johnson has lived a full and adventurous life to say the least. She starts out the book talking about running through the streets during bombings to get to the hospital where she worked. She was willing to take this risk to help others. This was the beginning of a life filled with adventure. Because so many people helped her survive by deeds of kindness, she adopted that almost as a rule. When she came to America she gave back to America the way others had given to her. I am not as adventurous or a daredevil like Ingeborg but I hope to live my life to the fullest as she has lived hers. There are so many wonderful stories or chapters to her life. This is a book that I will keep on my shelf. I will make sure I recommend it to my friends.